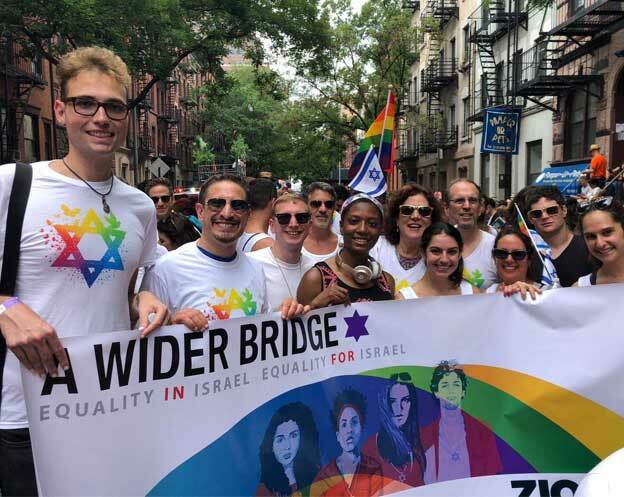 A Wider Bridge LGBT Journey to Israel alumnus Alex Boda continues to look back at a trip in his special blog. Today he looks at Friday in Tel Aviv. There’s no better way to start off your mornings in Israel other than having an “Israeli” breakfast, which is very rich and full of choices, and that’s exactly what we did. The breakfast at the Art Plus hotel in Tel Aviv includes a variety of Israeli cheeses, salads, eggs, and the ever memorable shakshuka, which is a very hot tomato sauce with cooked eggs in a confection of delicious spices. After this gorgeous affair the group set out and arrived at Independence Hall, located on Rothschild Blvd. There we encountered Israel’s remarkable history. There we met the educational director, who spoke to us about the program’s pedagogical mission. He gave a description of the role the Hall provides, provoking thought among its American and Israeli participants. Afterwards, we toured the Hall and learned about the signing of the Israeli Declaration of Independence in 1948. This was incredibly moving; this is where it “all went down” as they say. 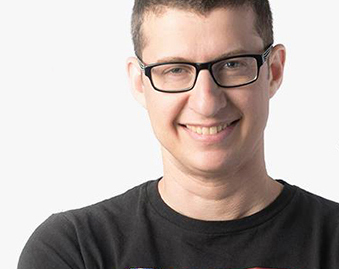 After this, the group set out to one of the most important landmarks for the Israeli LGBTQ community: the LGBT Center at Gan Meir (Park Meir). 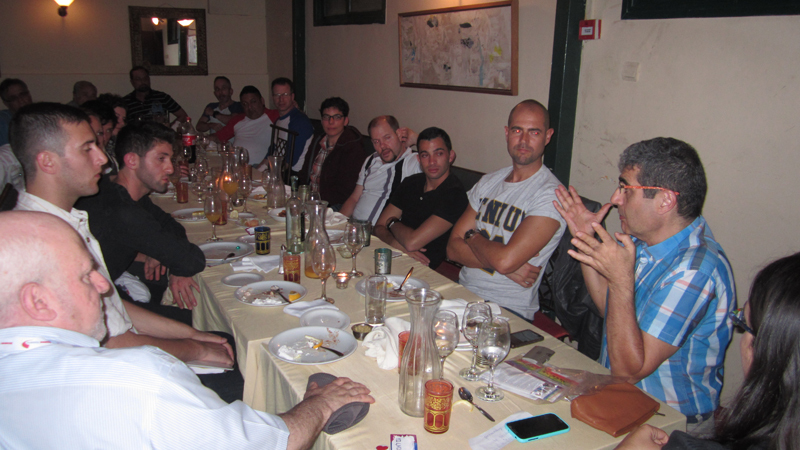 There we met leaders of a variety of organizations who explained their work, and talked especially about how much the LGBT community in Israel has evolved in the past decade. We met with leaders of The Aguda, Israel’s oldest and largest LGBT rights organization and other key organizations in the community, including Israel Gay Youth (that runs support groups and leadership programs for LGBT teens), Tehila (a group for parents and families of LGBT children), and Hoshen (a group that works on providing presentations about LGBT life to Israel’s schools and army). We also met with one of Israel’s most prominent transgender activists, and learned about the special challenges facing that community. After the event at Gan Meir there was plenty of free time to explore the hidden gems of the famous Carmel market or Dizengoff Center, Israel’s first mall. The mall boasts over 420 stores and is visited by over 25,000 shoppers daily and even double on Fridays – because on Fridays, from 8am-4pm (Shabbat is coming, nu!) a very special thing happens at the mall: the food market, which brings together an entire range of home-cooked food from many traditions and countries under one massive roof: Israeli, Turkish, Iraqi, Moroccan, Indian, Thai and many more. Such a delight! It reminds us that Israel is actually an aggregation of cultures. Many Jews have made Aliyah to Israel and brought their various cultures (and yummy food!) with them, and that’s one of the things that makes Israel so special. It’s a mixture. Just before Shabbat we headed to Hillel’s shul, Yachad, an orthodox minyan that has a large portion of LGBT people in the congregation. This was truly a magical experience, at least for me, Just seeing other gay men pray and dance together with kippot and tzizit brought me back to days when I thought my way of life was forbidden and there it was, right before my eyes. It changed my life forever for the better. For many in our group, an orthodox prayer service was a new experience, yet it was a chance to be part of an authentically Israeli phenomenon, a religious community in which LGBT people (and their families) participated openly and proudly, and served in leadership. After “Aravit” (evening) prayer we had a dinner at the shul that was hosted by our new friends Zehorit, her partner Limor, and Gidi, all of whom are leaders within Israel’s religious LGBT community. They spoke with us about the work of Havruta, an organization for religious gay men and Bat Kol, a group for religious lesbians. We learned about The Pride Minyan, a group that organizes religious services for the LGBT community on holidays and other special Shabbaton, and Shoval, a speakers bureau through which religious LGBT people tell their stories to community and educational leaders. It was great to get to share dinner with many members of the community, including Avigail Sperber, one of the founders of Bat Kol. Many of their stories, about wanting a life in which they could be both religious and LGBT, felt very similar to the stories of people in our own group. It was an amazing dinner, full of great food and camraderie. Most of us went to sleep relatively early (even though there was an option to go out to the bars). We just had to get rid of the jet lag! Shabbat in Israel doesn’t get much better than this. 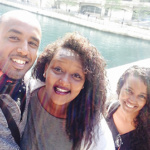 LGBT Ethiopian Israeli activists visit U.S.